Cushion Stitch—the ancient Opus Pulvinarium of the Middle Ages, likewise called “Cross Stitch”—may lay claim to be one of the most ancient known in embroidery. There have been many varieties, but the principle is the same in all. It is worked on and through canvas, of which the threads, as in tapestry, regulate the stitches. After six centuries of popularity it finally died out within the last few years as “Berlin wool work;” but will doubtless be revived again in some form after a time, as being well fitted for covering furniture on account of its firmness and durability. In Germany and Russia it is still much used for embroidering conventional designs on linen; and the beautiful Cretan and Persian work of which so much has lately been in the market, is executed in this style. Tent Stitch may be placed first under this class, in [Pg 46] which the thread coming from beneath is carried over a single cross of the warp and woof of the canvas. 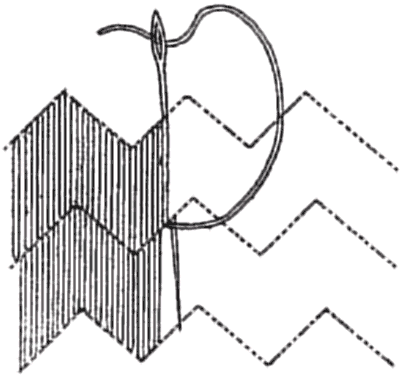 Simple Cross Stitch.—The worsted or silk is brought up again to the surface, one thread to the left of the spot where the needle was inserted, and is crossed over the first or “tent” stitch, forming a regular and even cross on the surface. Persian Cross Stitch.—The peculiarity of this stitch is that in the first instance the silk or worsted is carried [Pg 47] across two threads of the canvas ground, and is brought up in the intermediate space. It is then crossed over the latter half of the original stitch, and a fresh start is made. Much of the beauty of Persian embroidery is produced by the irregularity of the crossing; the stitches being taken in masses, in any direction that seems most suitable to the design in hand, instead of being placed in regular rows, with the stitches all sloping in one direction, as is the case with the modern “Berlin work,” this, with the happy choice of colours for which the Persians are so justly famous, produces a singular richness of effect. Allied to these canvas stitches and having their origin in them, are the numerous forms of groundings, which are now worked on coarse linens, or in fact on any fabric; and have sometimes, although incorrectly, been called darning stitches, probably from their resemblance to the patterns which are found on samplers, for darning stockings, old table linen, &c. &c. Almost any pattern can be produced in this style of embroidery, simply by varying the relative length of the stitches. Following the nomenclature of the committee which named and catalogued the specimens of ancient needlework exhibited in the South Kensington Museum in 1872, we have classed all the varieties of these grounding stitches under the name of Cushion stitch. Cushion Stitches are taken as in laid embroidery, so as to leave all the silk and crewel on the surface, and only a single thread of the ground is taken up; but in place of lying in long lines, from end to end of the material, they [Pg 48] are of even length, and are taken in a pattern, such as a waved line or zigzag; so that when finished the ground presents the appearance of a woven fabric. 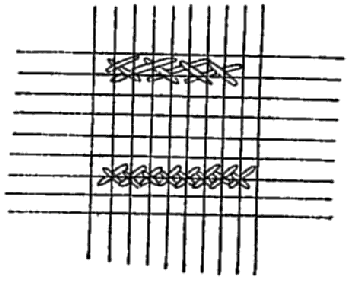 We give an illustration of one variety of cushion stitch, which may either be worked as described here, or in the hand, as in the woodcut. A good modern example of this background was exhibited in the School, on a bed-hanging, worked for the Honourable Mrs. Percy Wyndham, from a design by Mr. W. Morris. In the Exhibition of Ancient Needlework last year were many beautiful specimens: notably one enormous wall-hanging of Italian seventeenth-century work, lent by Earl Spencer. Many of the fabrics known as “Tapestries” are woven imitations of these grounds, and carry embroidery so perfectly, that on the whole, except for small pieces, it seems a waste of hand-labour to work them in, as the effect is not very far removed from that of woven material, while the expense is, of course, very much greater. [Pg 49] The ancient specimens of this stitch are worked on a coarse canvas, differing greatly from that which was recently used for Berlin wool work. It cannot now be obtained except by having it especially made to order. It has been replaced by a coarse hand-woven linen for the use of the School, but the ancient canvas is vastly superior, as its looseness makes it easier for the worker to keep her stitches in regular lines. In some ancient specimens the design is worked in feather stitch, and the whole ground in cushion stitch. In others the design is in fine cross or tent stitch. There are several very beautiful examples of this kind of embroidery in the South Kensington Museum—Italian, of the seventeenth century. A variety of cushion stitch, which we frequently see in old Italian embroideries, was taught in the Royal School of Art-Needlework by Miss Burden, and used under her direction in working flesh in some large figures designed by Mr. Walter Crane for wall decoration, and exhibited at the Centennial Exhibition at Philadelphia. The stitches are kept of one uniform length across the design. The next row is started from half the depth of the preceding stitch and kept of the same length throughout. Its beauty consists in its perfect regularity. If worked in the hand, the needle is brought back underneath the material as in satin stitch; but in the frame all the silk or worsted can be worked on the surface, with the exception of the small fastening stitches. The effect when finished is that of a woven fabric. This form of cushion stitch worked extremely fine has been used for flesh in very ancient embroideries, even before the introduction of the Opus Anglicanum, and is found in the works of the Flemish, German, Italian, and French schools of the fourteenth and fifteenth centuries. It seems to have been worked in a frame on fine canvas, or on a fabric of very even threads, and the stitches so taken that the same amount of silk appears on the back as on the surface of the embroidery. In a toilet cover of ancient Spanish work recently added to the South Kensington Museum, the design is entirely embroidered in varieties of cushion stitch in black floss silk upon a white linen ground. It is, however, extremely rare to see this stitch used in any other way than as a ground, except in actual canvas work; in which we often see varieties of it used to fill in portions of the design, while another stitch will be devoted entirely to the grounding. These stitches were often executed on an open net. [Pg 51] Stem Stitch is used in frame embroidery, and does not differ in any way from that described at page 20, under “handwork,” except that the needle is of course worked through the material with both hands, as is the case in all frame work. The same may be said of “split stitch;” but this is more frequently (because more easily) worked in a frame than done in the hand. 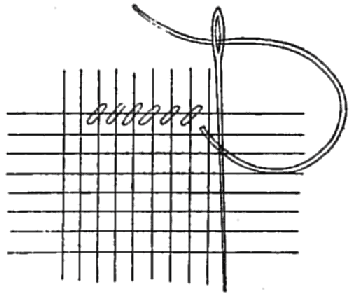 Japanese Stitch is a modification of stem, but its peculiarity consists in the worker taking very long stitches, and then bringing the needle back to within a short distance of the first starting-place; so that they may be in even parallel lines, advancing by gradation from left to right. It is principally used for working water or ground in a landscape. Tambour Work has fallen into disuse, but was greatly admired when our grandmothers in the last century sprigged Indian muslins or silks with coloured flowers for dresses, and copied or adapted Indian designs on fine linen coverlets. These were very refined, but no more effective than a good chintz. There are exquisite specimens of the stitch to be seen in most English homes, and in France it was in vogue in the days of Marie Antoinette. Its use is now almost confined to the [Pg 52] manufacture of what is known as Irish or Limerick lace, which is made on net in the old tambour frames, and with a tambour or crochet hook. The frame is formed of two rings of wood or iron, made to fit loosely one within the other. Both rings are covered with baize or flannel wound round them till the inner one can only just be passed through the outer. The fabric to be embroidered is placed over the smaller hoop, and the other is pressed down over it and firmly fixed with a screw. A small wooden frame of this description is universally used in Ireland for white embroidery on linen or muslin. 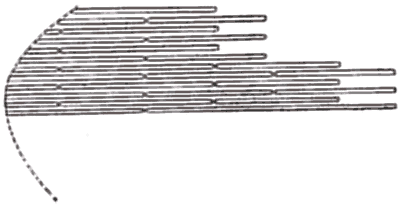 In tambour work the thread is kept below the frame and guided by the left hand, while the hook or crochet needle is passed from the surface through the fabric, and brings up a loop of the thread through the preceding stitch, and the needle again inserted, forming thus a close chain on the surface of the work. 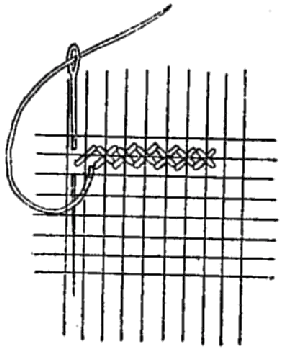 The difficulty of working chain stitch in a frame probably led to the introduction of a hook for this class of embroidery. Perhaps we ought not to omit all mention of the Opus Anglicum or Anglicanum (English work), though it is strictly ecclesiastical, and therefore does not enter into our province. Dr. Rock and other authorities agree in thinking that the distinctive feature of this style, which was introduced about the end of the thirteenth century, was a new way of working the flesh in subjects containing figures. [Pg 53] Instead of the faces being worked in rows of straight stitches (like that described as Burden stitch on page 50) as we see in the old Flemish, German, and Italian work of the same period, the English embroiderers invented a new stitch, which they commenced in the centre of the cheek and worked round and round—gradually letting the lines fall into outer circles of ordinary feather stitch. Having thus prepared an elastic surface, they proceeded to model the forms and make lights and shadows by pressing the work into hollows, with small heated metal balls, the work being probably damped as a preparation for this process. So skilfully did they carry out their intention, that the effect is still the same after the lapse of five centuries. We must unwillingly add that, though much appreciated in the thirteenth century, the effect is rather curious and quaint than beautiful. The Syon cope in the Kensington Museum, of the thirteenth century, is a fine specimen of this attempt to give the effect of bas-relief to the sacred subjects depicted. The whole cope shows how various were the stitches worked at that period. On examination with a microscope, the flesh stitch appears to be merely a fine split stitch worked spirally, as we now work fruit. See Dr. Rock’s preface to his “Descriptive Catalogue of Textile Fabrics” in the Kensington Museum.